Michael Meads, 19, of Kennebunk, ME passed away peacefully on February 14, 2019 after a three month battle with adenovirus. He was surrounded by his mother, Melissa, and his siblings, Spencer, Faith, Sarah, and Timothy. During his sickness, Michael displayed the same resilience, mental toughness, and spiritual strength he exemplified throughout his life. Michael was born on March 15, 1999 in Fredericksburg, Virginia, a blissful gift to his four siblings and parents. After spending his toddler years in Culpeper, VA Michael and his family moved to Nashua, NH. He created treasured memories in the North End neighborhood, especially with the loving LaPlante family and his classmates at St. Christopher’s School. Michael vacationed every year at his grandparents’ home in Kennebunk with his aunts, uncles and twenty-five Flaherty cousins. In 2012, his family moved to Kennebunk year round. With his four siblings at college and beyond, Michael and his mother created a special life together, with a new addition, his goldendoodle, Valor. Michael was a hard worker from an early age and dedicated every summer to his job at Old Salt’s Pantry. He demonstrated a sincere compassion for others and started Meads Feeds Maine to help those in need. Michael attended Kennebunk High School for two years where he befriended many. 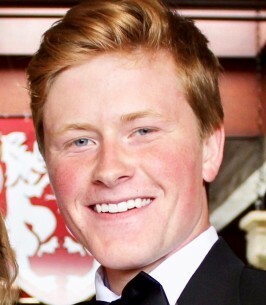 Michael graduated from Portsmouth Abbey School (RI) in 2018. He cherished his two years at the Abbey where he found kindness and inspiration from teachers, coaches and many loyal friends. His time there deepened his Catholic faith and instilled in him a sense of purpose. Michael was bestowed the honor of prefect of his dorm as he was known for his empathy and quiet leadership. On the football field, he quarterbacked the Ravens to an Evergreen Conference Championship and an appearance in the NEPSAC Class C Championship. He was the recipient of the Excellence in Public Speaking Award and the St. Gregory Award. Michael was chosen to attend the Tommy Franks 4-Star Leadership Program in Oklahoma in the Summer of 2017. Michael was a freshman at the University of Wisconsin-Madison. When he became sick he was in the process of applying for the Naval ROTC program and enrolling in neurobiology classes. He planned to become a Navy SEAL and a neurosurgeon. His humble manner belied such ambitious plans, but all who knew Michael recognized his promise and would never doubt his determination to succeed. Michael was a pledge brother of Phi Gamma Delta. Michael was a stoic leader who lived his life by example and with deep conviction. He valued his Catholic faith, his family, and his friendships. He loved riding the waves of the cold Maine ocean, rooting for the New England Patriots, and entrenching himself in a good book. Michael brought a unique joy to all who knew him. He will be dearly missed. Michael is survived by his mother, Melissa (Flaherty) Meads of Kennebunk, ME, his siblings Spencer Meads of Middle Village, NY, Faith Meads of Boston, MA, Sarah Meads of Boston, MA, and Timothy Meads of Washington D.C. He is predeceased by his maternal grandparents, John and Helen Flaherty, his aunt Nancy Flaherty, and survived by five Flaherty aunts, six uncles, and 25 cousins. He is also survived by his father Thomas Meads, his paternal grandparents, Ed and Barbara Meads, three Meads uncles, three aunts, and seven cousins. Visiting Hours will be held on Monday, February 18th from 3pm-7pm at Bibber Memorial Chapel, located at 67 Summer St, Kennebunk, ME 04043 and a Funeral Mass will be held on Tuesday, February 19th at 11am at St. Martha’s Catholic Church, located at 30 Portland Rd, Kennebunk, ME 04043. In lieu of flowers the family requests that contributions be made toward a scholarship in memory of Michael Meads and sent to Portsmouth Abbey School, 285 Corys Lane Portsmouth, RI 02871.